Let’s face it, who isn’t strapped for space these days? Everyone is doing more with less, and gardening in the bag is a natural to follow with Deck Gardening, Balcony Gardening, Rooftop Gardening and last but not least, Poolside Gardening… It could happen… Follow along! Now we’ve heard everything: Plant your garden in bags of topsoil! Might be a better idea than it sounds. Here’s why. Gardens often benefit from out-of-the-box thinking, so we were intrigued by an out-of-the-bag planting method we read about on Pinterest. Tired of fighting bad soil and annual chickweed, Pinterest poster Lois Ruskell bought nine bags of topsoil on sale, laid them flat in her garden, cut slits in the top and bottom, and planted seeds and plants directly in the bags. 2. Not only will few or no weeds grow around your plants (weeds typically result from seeds and spores in your soil that are dormant until spring), the bags will smother existing weeds under the plastic. 3. Next year, you can empty the topsoil into the garden and begin building up the beds. Use the plastic to suppress weeds in garden paths. 1. It’s only good for shallow-rooted plants, like lettuce and tomatoes. Root vegetables, like beets or carrots, need a deeper growing medium, though I guess you could stand the bags up and plant root veggies that way, if you can figure out how to keep the bags from toppling over. 2. There are no worms in the bags, and worms are natural fertilizer and aeration machines. 3. Topsoil needs fortification from compost, manure, or peat moss, which help retain moisture and add nutrients. 4. Will just a couple of slits provide a large enough opening for water to get in and out of the bag? We’re not so sure. 5. But our biggest concern is that a plastic bag garden doesn’t look so hot, which won’t do much for your home’s curb appeal. 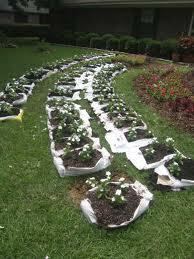 So if you try this method (and I’m going to), cover the bags with mulch. This entry was posted in Home & Garden, Home Ownership By Age Group, Homeownership and tagged Compost, Garden, Gardening in a bag, Home, Pinterest, Plant, Plastic bag, Root, Soil. Bookmark the permalink.